Exeter College has its own commercial restaurant, open to the public every lunchtime and two evenings per week. 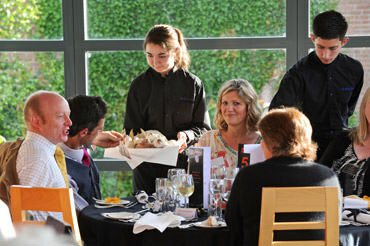 The restaurant is fully licensed and all food is prepared and served by students. Devon Food and Drink Guide 2012 reviewed the restaurant and described it as: "No ordinary college restaurant. The inspired five-course table d'hote menu on offer, alongside the fine selection of affordable wines and the contemporary, stylish surroundings, make dining here a treat for any discerning foodie." For opening hours and to view the current menu visit our webpage.